Taking care of your mountain bike and maintaining it ensures that it lasts for long. Mountain bikes promise years of fun and adventure, only if you know how to take care of all the parts. Your lube should be applied to your bike chain after you’ve cleaned it thoroughly. Otherwise, you will be actually rubbing dust particles against your chain, causing more friction and wear. Applying high-quality MTB chain oil is not a difficult job but is essential to lengthening the life of your bike. 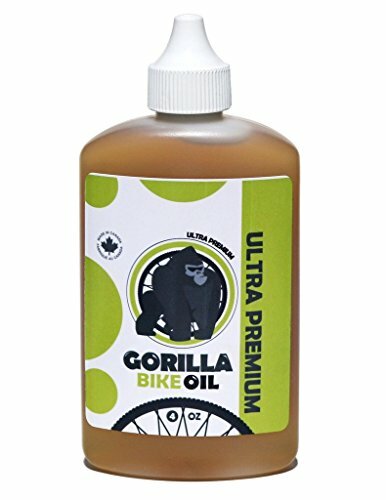 How to Buy the Best Mountain Bike Chain oil? a) Wet or Dry Lubricant? b) How Long are You Planning to Travel? d) Spray or Drip Lube? We have tested and reviewed some of the most popular products on the market. Our team came up with the mountain bike chain lube reviews. You can browse our list to find a product that will improve the performance of your chain and allow your bike to go faster. This lube applies really easily and keeps your bike chain working as it is supposed to. It first goes on wet but dries to a wax-like finish. This will help dirt and grimes slide off the chain. Dirt will not stick to your bike chain and it will stay clean, smooth and efficient. This is a great lube because it is affordable and versatile. Regardless the model of your MTB, this lube will keep your chain smooth and clean. It is made of synthetic oils combined with Teflon which make a very thick finish that will not get scratched easily by dust particles. 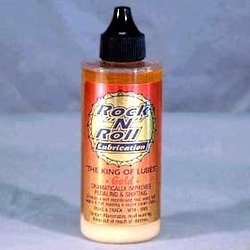 This is the perfect lube to reduce signs of wear that result from repeated friction. It quickly coats different parts of your bike chain and enhances its durability. It has a low surface tension and repels moisture. It is specifically designed for performance in dry weather but also improves the performance in wet weather. This oil is the best to use in a dusty environment as it will keep abrasive dirt particles at bay. It is a budget-friendly option to pick because one coat can withstand rides up to 100 miles with no problem. A budget-friendly option that lasts for long. Applies wet to coat different parts quickly. Dries to a wax-like finish that will keep your chain smooth. Prevents the accumulation of abrasive dust particles. Improves the performance in wet weather. You can hear a squeaky noise if you start pedaling before it dries completely. If you want something to clean, protect and lubricate your chain then this is the best bike chain oil to buy. This is the perfect bike chain to lubricate and protect your chain from moisture and corrosion due to metal friction. The lubricant contains solvents that dissolve grime and dirt particles and prevent their accumulation. It has a low viscosity and this means that it coats every single part of the chain really fast. It even reaches all the moving hard to reach parts, protecting them and maintaining their condition. This oil works very well even in extreme conditions and temperatures. It can protect your chain from -60 to 475 degrees Fahrenheit and pressure up to 3000 pounds and this means that your chain will last for long. What we really love about this amazing oil is that it protects your chain from moisture and rust. Metal to metal friction causes corrosion that will shorten the life of your bike chain. This means that you will have to replace it more often. This lube comes with a small hose for easy and fast application. It is affordable and doesn’t take much time to apply. 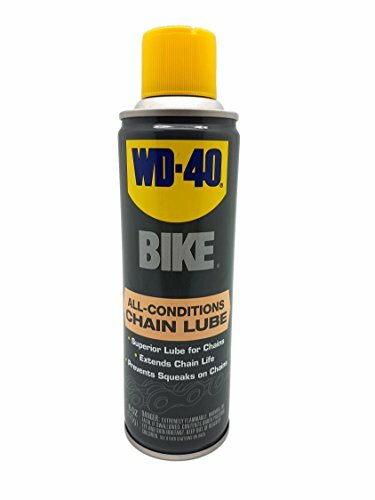 Thanks to this lube, you will be using your chain for long. Triple action for cleaning, protecting and lubricating your bike chain. Solvents to dissolve dirt particles and prevent their accumulation. Designed to work in extreme temperature and under pressure. Protects against moisture, rust and metal corrosion. Low viscosity to cover all moving parts. Might cause too much build-up because it applies fast. This is the best bicycle chain lube to use if you want a self-cleaning wax-style lubricant. It applies wet then dries to a wax-like finish that keeps contaminants away. Your chain will stay clean and will work smoothly. It doesn’t leave an oily residue that attracts dirt particles. This means that your chain will stay clean and will work better and faster. This lubricant actually lengthens the life of your bike chain by 2 or 3 folds. It is called self-cleaning because its action is actually activated by dust and dirt particles. As these get in contact with your lube, the outer layer of the wax will start to flake taking away the grime and dirt with it. This will leave your bike chain properly coated and protected. This is the best lube for extreme conditions. As a matter of fact, the dirtier the ride, the more active the cleaning action. It keeps your chain clean and prevents metal friction. You will only have to apply this lubricant often after very dirty rides. Wet application that dries to a wax-like finish. Reaches all the moving and hidden parts to coat and protect them. Lengthens the life of your bike chain. Self-cleaning action activated by dirt particles. Reduces metal corrosion due to friction. Doesn’t apply very fast. You need to squeeze the bottle really hard to get a consistent drip. This is an extraordinary bike lube that will keep your chains clean. They will always look like they just got out of the box thanks to the dual action of this bike lube. The lubricantsimultaneously cleans and protects your chain by lubricating it. 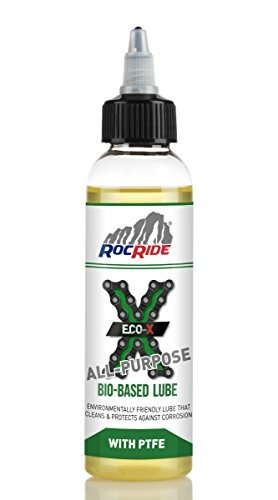 This is a versatile bike lube that works for all kinds of MTBs and road bikes. It is also very easy to apply and quickly coats your chain to prevent excessive metal friction. This is the main reason why your chain might need to be replaced too often and can be subject to rust and breakage. Applying this lubricant ensures that your bike can go fast and quietly as it is made to smooth out the motion of your chain. Using it regularly will lengthen the life of your chain so that you don’t have to replace it often. It is an excellent lube that is super affordable and will last for long. Versatile oil that works for all road bikes and MTBs. 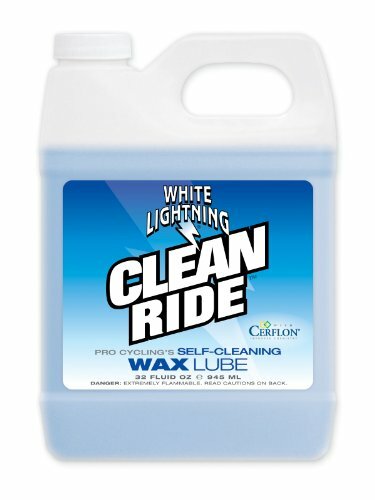 Cleans and protects your bike chain at the same time. Applies easily and quickly coats your bike chain. Prevents metal friction and excessive wear. Ensures quiet and smooth functioning of your chain. You need to shake it very well before every application to prevent excessive buildup. This is a breakthrough product that sets new standards for what you can expect from a bike lube. It is the highest mileage among other products and this means that it will keep on protecting your chain and reduce friction for as long as you want to go. You can go up to 400 miles without reapplying your lube. Just make sure that you clean your bike chain very well then apply a thin film of the lube. 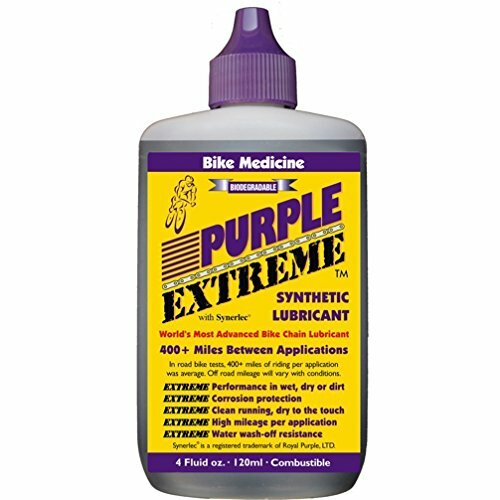 This is a long-lasting bike lube that will withstand working in all extreme weather conditions. It doesn’t get affected by mud or snow. It was primarily designed to lube chains in oil rigs that work in salt water and this means that will not stop protecting your chain regardless of the riding conditions. It is designed to endure high pressure, thus allowing you to enjoy a quiet and smooth ride whenever you feel like it. This lubricant has high film strength that separates two metal surfaces. Other cheap lubricants can destroy your bike chain and will not prevent excessive friction, corrosion or rust. Although this synthetic lube is affordable, it actually works even better than more expensive products. This is the best product to buy if you want to take care of your MTB and keep it working for long. It can ensure your safety and the quality of your mountain biking adventure. Works in extreme weather conditions. Reduces friction of metal surfaces even under pressure and load. High film strength to reduce corrosion. In order to protect your bike chain, you need to make sure that all the old residue has been properly removed and that a new protective film is applied. This oil does the job perfectly. It removes all the old buildup that prevents your bike from running smoothly and swiftly coats your bike chain to ensure fast and smooth operation. This is one of the best products that you can use to lengthen the life of your chain. It works very well even in extreme riding and weather conditions. Regardless of the temperature, the humidity level and how challenging the trail is, your bike lube will work the way it should. It also repels moisture and water which can ultimately cause rust. Water particles, as well as dust particles, will slide right off your bike for better performance. This is a biodegradable and eco-friendly product that will biodegrade safely. It doesn’t contain any harmful chemicals that could damage your bike chain and other moving parts in the long run. It doesn’t get washed away with water and doesn’t flake upon contact with grime and dust. Removes old build up and applies smoothly. Lengthens the life of your bike chain and other moving parts. Repels moisture and water to prevent rust and corrosion. Biodegradable and eco-friendly product that doesn’t contain harmful chemicals. It is not the best lube to use in dry sandy conditions. It gums up in dry conditions. It takes some time to dry. This is an excellent option for people who want to maintain the condition of their bikes without having to spend too much money. For an affordable price, this Teflon lube will resist dirt and protect your bike chain. Teflon protects your chain from wear due to metal friction. The can features an O-ring for safety, ensuring that your lubricant lasts for as long as you need it. The bottle is compact and is very easy to store. This bike lube resists water and moisture which eventually can cause rust and corrosion. It applies wet thanks to its low viscosity but dries to a dry finish that will protect your bike. It provides a thermally stable barrier between the moving parts to reduce chain stretching. It stays in place and doesn’t flake off even at high speeds. The wax life film doesn’t absorb dirt and actually gets rid of the abrasive dirt particles thanks to the self-cleaning feature. Any particles simply don’t stick to your bike chain ensuring that it can work for long quietly and smoothly. This lube lasts for long and withstands extreme weather conditions for the best mountain biking experience. Fast application that dries to a wax finish. Abrasive particles don’t stick to the lubricant. Works in extreme riding conditions. Due to the low viscosity, it might run down onto the ground. You will not be able to get all the residue in the can. Old, rusty and squeaky chains are extremely noisy. Applying this lubricant will keep your bike chain working fast and smoothly. It can work in wet or dry conditions to extend the life of your bike and all its moving parts. This lube protects your bike chain against corrosion even after traveling for long distances. This lube prevents friction and excessive buildup. 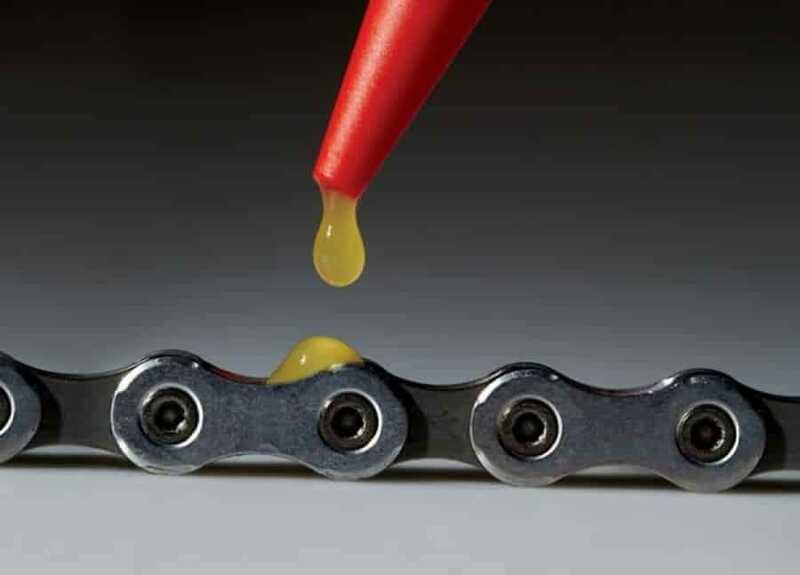 Wax lubricants can gum up and prevent the smooth operation of your bike chain but this lubricant applies smoothly in a thin film that will extend the life of your chain. As soon as you apply this lube, it protects your chain from the accumulation of abrasive dust particles and other contaminants that might damage your chain. It doesn’t leave a sticky residue or prevent the smooth operation of the moving parts. This is a lubricant that you can really trust and depend on. It has been tested by several trustworthy parties to make sure that it will maintain your bike and protect it. Extends the life of your bike and all the moving parts. No wax buildup or sticky residue. Prevents the sticking of abrasive particles. Has been tested for efficiency. If you are looking for a safe and environmentally-friendly lube then this is the one you should think about. It is made of safe vegetable oils and lubricant blends to protect your bike chain. This is a wet lube that will not cause any buildup but will keep your bike chain running smoothly. This lubricant contains anti-oxidants that are extremely safe and will protect your chain from wear and corrosion. It reduces metal to metal friction as a result of the bike movement and this means that your bike chain will last for long. This is a versatile product that you can use with different types of road bikes and mountain bikes because it is extremely safe and easy to use. It cleans and protects especially in very dirty conditions where your bike chain is more likely to get covered with abrasive dirt particles. It also improves the bike performance in wet conditions as it repels moisture. It is the perfect choice for riders who take long rides and want to enjoy their peace of mind. Safe product that doesn’t contain harmful chemicals. Wet lubricant that doesn’t cause any sticky residue or buildup. Improves the performance of your bike chain and prevents metal corrosion. Specifically designed for very dusty or dirty conditions. Needs to be shaken very well before use. For an extremely affordable price, you will buy an extremely shear lubricant with extra strength to protect all the important moving parts of your MTB. This is the perfect lube to repel moisture and water. These are the main reasons behind metal corrosion caused by rust. It will protect your bike chain and allows you to use it without having to worry about replacing it that often. This is a synthetic lubricant that will protect your bike chain and keep it moving smoothly. It reduces the squeaking noise and keeps your chain running quietly and fast. It is clean and very easy to apply and doesn’t run down other parts of your bike and will dry fast. Dust particles will not stick to your bike chain. The chain will run with no resistance that might slow you down along the trail. Although the bike is rather small, it will last sometime before you have to spend more money to get a new one. Extreme protection to different parts of your bike’s moving parts. Dust particles don’t stick to the chain. Bike chain lubes come in different kinds and brands. Finding the best product is not an easy task but can greatly improve the quality of your ride. A good mountain bike lubricant is essential to protect your chain and the moving parts of your MTB. Bike lubes are either wet or dry. Wet and dry lubricants provide the needed protection to your bike chain, but choosing the type depends greatly on the conditions where you usually ride. Wet lubricants work better in winter and wet conditions. They are extremely useful especially if you are riding in the snow because the lube doesn’t wash off easily. Wet lubes also work to resist salt erosion and will last for 100 miles of travel or even more with one application. 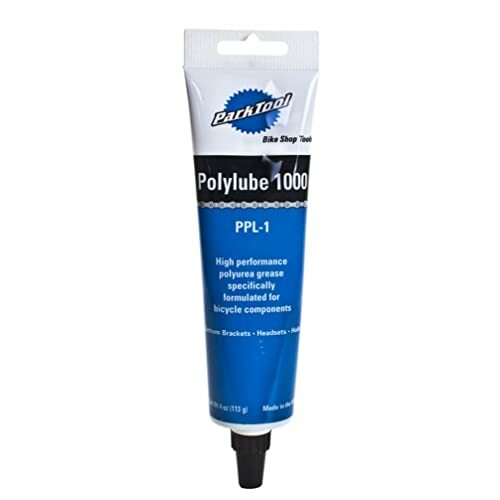 A lot of riders prefer wet lubes to reduce the noise and enjoy a smooth and quiet ride. Dry lubes work better in the summer months or in dirty or dusty riding conditions. Most dry lubes apply wet but the liquid evaporates leaving only a wax-like film. Unlike wet lubes, dirt doesn’t get trapped in the lube and doesn’t cause an annoying buildup that will prevent your bike chain from moving smoothly. Dry lubes are not the best to use in the rain and will have to be applied more frequently. If you are planning to travel a long distance, then a wet lube is definitely better to use. It doesn’t wear off quickly and will have to be cleaned often, especially if you are traveling in dusty conditions. Nevertheless, if you are traveling in dusty conditions, a dry lube might be a better option, even if you have to apply it more often. A good lube should have low viscosity. This means that it will be rather runny to apply fast. As you pedal, the lube will spread and coat your bike chain and all the moving parts of the bike. The fast application ensures that your chain will be protected against rust, corrosion, and friction. If you are not an expert, a good and fast lube will make your job easier. Whether you are working with wet or dry lube, you should make sure that it dries fast and properly. This will prevent dust, grime, and other contaminants from sticking to your bike chain. Some lubricants tend to separate when left for long periods of time. These need to be shaken well before you can apply a protective film. Drip lubes provide a better application to coat all the moving parts of your bike chain. You can easily focus the lube and prevent the wear of your bike chain but the lubricant can drip onto the ground. A spray lubricant is easier to apply and doesn’t cause much mess during application. It can reach all the difficult corners and crevices with no problem whatsoever. Drip lubricants are messy but you can get the last drop in every bottle. Spray cans are easier to use and hold but they tend to finish faster. Every mountain biker should devote some time to regularly applying lube to the bike chain. Degreasing your bike chain improves its performance and prevents early wear. This means that you will not be spending much money on replacing your bike chain or fixing other parts that might get ruined because of excessive friction. The best mountain bike chain lubes will improve your experience on your MTB and will ensure that you spend less time and money on replacing the chain.